Copyright traps are fabrications deliberately tucked into otherwise factual publications in order to detect third-party copying. 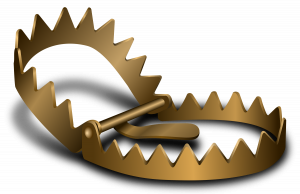 Duke’s Law Library’s blog highlights some of the most common traps. For more information on the related topic of plagiarism, check out C|M|Law Library’s Scholarly Writing Resource Guide, which contains useful information for researchers, writers, and students. 12 U.S.C.A. § 1426 (West 2010). 12 U.S.C.S. § 1710 (LexisNexis 1993). One trick to remember who publishes which unofficial version of the Code – the U.S.C.S. ends in “S” and Lexis ends in “S”.